Weelas technology for producing power is unique and patented. Electrical resistance offers a diverse, efficient and safe workout. Power training with Weela is more efficient than with regular weights, because training can be boosted by putting more power on the eccentric movement. Muscles can produce more power in the return movement, in the eccentric stage, than in the lifting motion. By adding more weight to the returning eccentric movement, the muscle has to work harder. Weelas electric resistance gives this possibility, but with weights it is impossible without someone’s help. Emphasis on the eccentric movement gives a more powerful workout! Weelas electric motor forms resistance from 1 to 50 kg. The resistance seems heavier than with free weights since the weight doesn’t get in motion to ease the lift, but the muscle has to do the movement steadily through the whole movement. So, you can’t make the lift easier with speed! The picture above demonstrates the movement. When training with weights power is increased as the lift progresses when the torque grows. 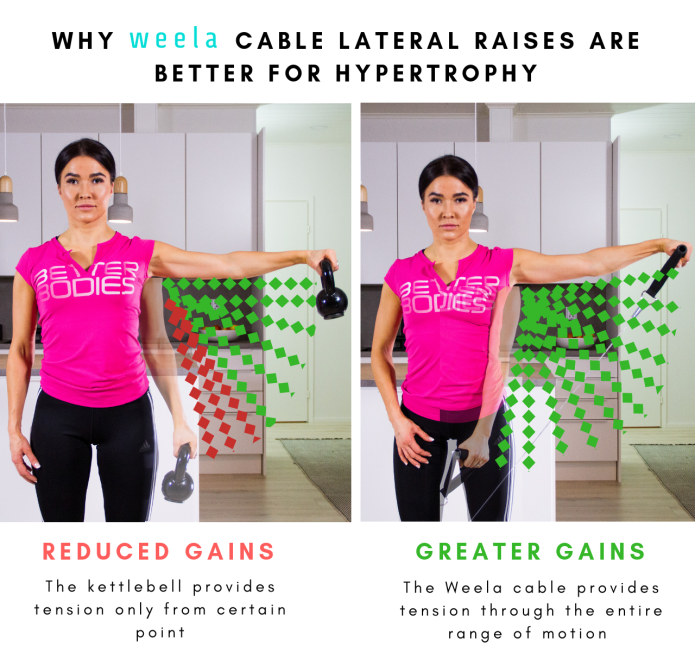 With Weela the direction of power can be made optimal in terms of the long range of motion and efficient training! Weela’s technology gives the opportunity for you to choose where the resistance starts. You can do the movement without the load, to the point which you want to start from. When setting the resistance in the beginning of the movement the machine stops the resistance in the “zero zone”. Because of this, you can do movements with high resistance even if they have a very hard starting position, such as the front squat or a French triceps extension. This also makes Weela safer to use. The weights can’t fall on toes if the handle slips, only the handle itself can fall. It’s easy to collect data from the electric resistance. This enables the intelligent WeelaTrainer App. Due to data collection the app can in real time track your workout session, calculate reps and accomplishments and show the practice history, for example for strength training progress. These features make electric resistance easier and more efficient than regular weights!